Connacht Rugby head to Bristol for a reunion with former coach Pat Lam and captain John Muldoon, looking to make it a hat-trick of pre-season wins. 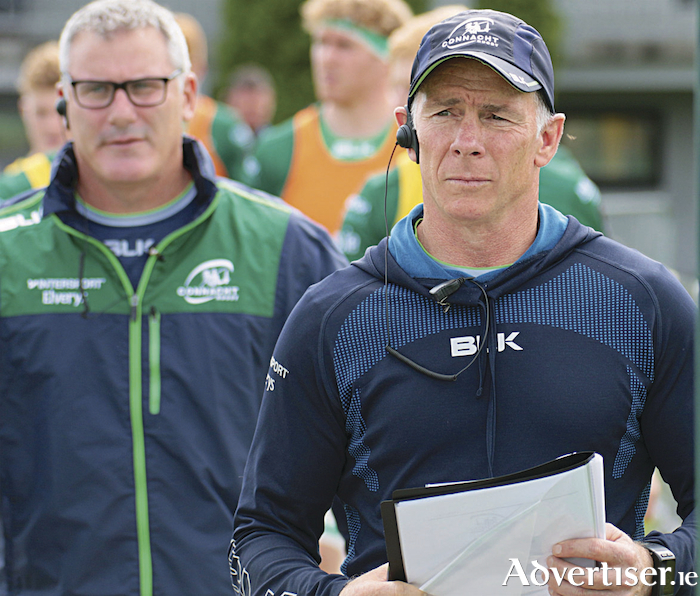 However Connacht will not expect any sentimentality from the newly promoted premiership side when the two meet in Ashton Gate Stadium (7.45pm ), despite the associations between the two outfits, including former players Jack Heenan and Aly Muldowney, and assisant coach Conor McPhillips. Certainly Connacht coach Andy Friend can expect a tougher challenge than that posed by a disappointing Wasps in Dubarry Park on Saturday, when Connacht ran out 43-10 winners, scoring seven tries in the process. There was much to admire in Connacht's performance, particularly the energy and commitment displayed on and off the ball, and another good performance against the Bristol Bears would be a huge fillip as Connacht begin their new Pro 14 era under Friend when Glasgow visit the Sportsground on Saturday September 1. Friend says he is "comfy" where his squad is at in terms of preparation and following the victory over Wasps. "We worked harder than the opposition, and that comes down to attitude. If you are prepared to work harder and put yourself in the tough positions some of the other teams don't want to go, you will end up getting more luck, and we worked harder," he says. "What was most pleasing was the way we scored some of the tries. It was a combination of some good forward play, some good open play, some good strike play, and to leak one try was pleasing. We are fully aware it's a pre-season, but winning becomes a habit, and the boys played some good football. "The starting XV did very well and then when the subs came on, they upped the ante, and we have some good footballers that we didn't see there today. The desire of the boys to get into the starting XV is very high, and we are getting some quality performances." New Brumbies' recruit Kyle Godwin was one to stand out in Dubarry Park, alongside try scorer and creator Tom Farrell. Outhalf Jack Carty looked assured on a return to his home ground, with Matt Healy and Niyi Adeolokun revelling in space on the wings. In youngsters, blindside Paul Boyle - one to watch - and lock Joe Maksymiw, there was much to admire, while new captain Jarrad Butler was his usual aggressive self at the breakdown, until forced off with a rib knock. Farrell struck for the first try after 11 minutes, created by a left wing Matt Healy, who bagged the second on 36 minutes for a 14-3 half time lead, with Wasps' three-pointer coming from outhalf Billy Searle. The second half, marked by full complements of players being introduced, began with a third try from fullback Cian Kelleher after a quick tap penalty by scrumhalf Caolan Blade. Niyi Adeolokun was helped on his way for the fourth by a slick pass from replacement Craig Ronaldson, while another sub, Rory Scholes, added the fifth. The pack created the sixth for replacement scrumhalf James Mitchell before Conor Carey completed the rout on 80 minutes - three minutes after Callum Sirker bagged Wasps' sole try. Connacht looked comfortable in their systems, with some super handling to put men in space. Friend says those systems were player led. "When I came in they were clear on the systems they wanted to play. The players have had input with that, they know what they are meant to be doing, and all credit to the coaching staff and what they have put in place and to the players who have bought into it. At this stage I am very happy and with one more trial to go." Butler's rib knock injury is not expected to keep him out of action - his removal being more precautionary ahead of bigger challenges, and Friend says his appointment as captain was a "collective decision". "We had a cultural week, we had a facilitor came in - a guy I worked with in the Aussie sevens - and part of that was presenting our brand and the behaviour of how we work as a group. Once we announced what those behaviours were, I said to the group ' let's vote on who lives those the best', and that's how we got our leadership group and Jarrad was the one who the players voted lived the behaviours best. Friend says some of those behaviour models, included 'always put team before self'. "We have four or five we will hold onto, and they are important to the group, and they are the way they want to live so it's really important. In my view it is the best way teams are built - you have standards that are owned by the whole group and it's about living those and holding everyone to account on those." CONNACHT: C Kelleher ; N Adeolokun, K Godwin, T Farrell, M Healy; J Carty , C Blade ; D Buckley, D Heffernan, F Bealham, J Maksymiw, J Cannon, P Boyle, J Butler (cpt ), E McKeon. Replacements, J Connolly for Butler (15 ), S Delahunt for Heffernan (HT ), C Gallagher for Cannon (46 ), R Scholes for Healy and D Leader for Kelleher (50 ), C Ronaldson for Carty, E Griffin for Farrell and J Mitchell for Blade (all 52 ), C O'Donnell for Buckley and C Carey for Bealham (both 57 ), S O'Brien for McKeon (61 ), C de Buitléar for Adeolokun (65 ).